Buk Bak’s Ronnie Coaches may have died because of lack of oxygen at the Korle Bu Teaching Hospital, his family suspects. The late hip life musician died Thursday morning from a “heart problem”. Ronnie’s Sister, Audrey, told XYZ News Sunday that her parents have gotten some reports that suggest their son died because Korle Bu had no oxygen as of the time he was admitted on Wednesday. “…That was what we also heard; yes, my dad told me of it just yesterday so they are also investigating it to see how true that was”, Audrey said in an interview with XYZ News. Ronnie’s family are not the only people investigating the ‘lack of oxygen’ theory as a possible cause of the 36-year-old musician’s death. According to showbiz website GhanaGist.Com, Ronnie’s spiritual mother, one Osofo Maame, claimed the musician informed her on Wednesday via phone, while on admission, that the hospital was short of oxygen but “the doctors on duty at the time were working around the clock to resolve the situation”. The site said the lady Pastor quoted Ronnie as complaining during their phone conversation that: “Maa, I can’t breathe properly. I’m dying, I’m dying. They said the oxygen is finished and they are going to buy some. I’m dying. Maa, I’m dying”. Korle Bu however insists it had oxygen at the time of Ronnie’s admission. Its Public Relations Officer, Mustapha Salifu told XYZ News that: “No, that cannot be true because we’ve never run short of oxygen during the period that the patient was brought to the hospital”. According to him, “our oxygen plant is working and we are generating oxygen and serving all areas in the hospital so it can’t be, but we can’t disclose the cause of death of our patients to the public. It’s only the family that can decide that”. 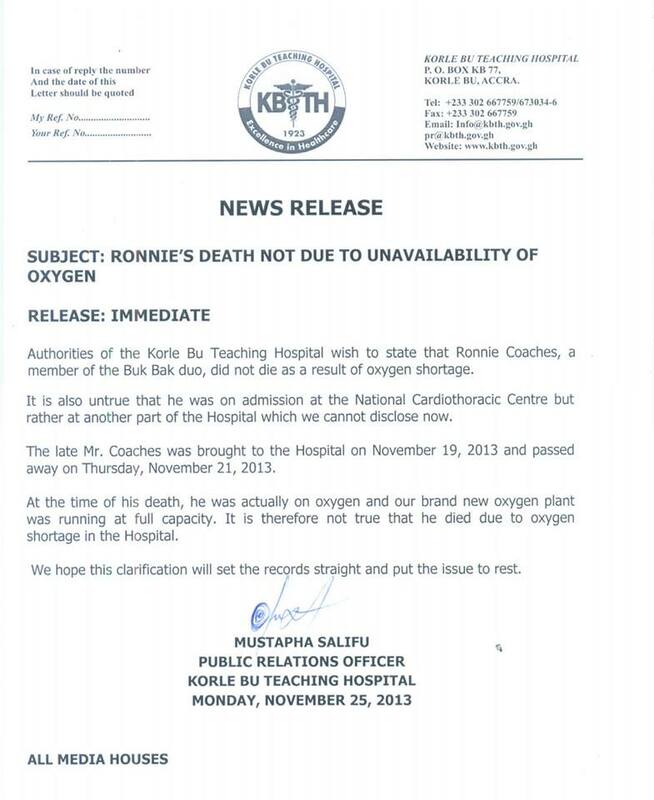 STATEMENT: Ronnie Coaches did not die as a result of oxygen Shortage – Korle Bu 0 out of 5 based on 0 ratings. 0 user reviews.